This 1-in 4-out component video/audio distribution amplifier is perfect for sending a single High Definition video and audio signal to 4 separate devices. You can use it to send HD video to several different televisions with no signal loss or use it for multiple dubbing projects. This distribution amplifier is able to be mounted on a wall and features both Y, Pb, Pr Component video and Right-Left audio. 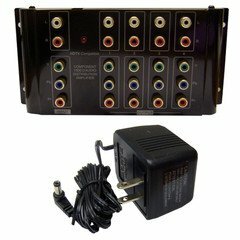 This distribution amplifier is able to be mounted on a wall and features both Y, Pb, Pr Component video and Right-Left audio. Connection: RCA Component (RGB) Video Male Plug Plus Audio L/R RCA Male Plugs. Dimensions: 3"L X2"W X2"H Inches.